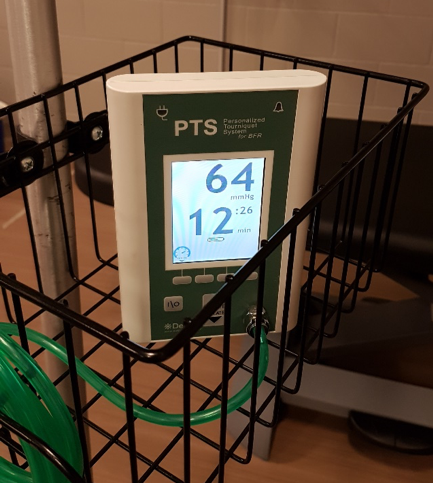 Blood flow restriction training (BFR) is attracting more and more attention as sports teams look at different ways to minimize return to play times for their athletes. In 2016, Paul Head (T: @PHphysio) introduced me to the benefits of blood flow restriction training for clinical populations (https://blogs.bmj.com/bjsm/2016/10/18/can-blood-flow-restriction-training-improve-outcomes-clinical-populations/). I’m pleased that recent BJSM articles have further explored this treatment. Rugby Canada invited me to see BFR being put to use in the elite sporting environment and learn how its benefits can be extended to the wider population. A 22-year-old professional rugby player sustained a grade 2 partial PCL tear during a Rugby ‘Sevens’ game on 10thDecember. Following the injury, the athlete was treated with four sessions of BFRT per week for four weeks. The rehabilitation program began with low intensity isometric exercises, progressing to dynamic lower limb loading (body weight to progressive load) that focused on quadriceps strengthening and maintenance. All sessions were conducted at 80% occlusion, and the athlete was asked to complete one set of 30 repetitions followed by three sets of 15 with 30sec rest between sets. From Dec 10 – Jan 11th, increases in muscle bulk of 2cm in quadriceps girth were observed (with measurements recorded at both 4” and 6” above the patella). There were increases seen of approximately 0.5cm of girth in measurements taken a week apart at both sites. Over this period, the athlete was able to fully complete the rehabilitation program, including conditioning on the bike (Dec 19-26th) and running (29th December). The athlete completed and cleared a battery of objective tests on January 9th, achieving a one-rep maximum within 10% of his contralateral limb. After reaching 90% of their pre-injury speed gate times at 10, 30 and 30-40m on the 15th of January, and completing the required force plate screening, the athlete was able to return to full training. The athlete returned to full international rugby match play on 26th January and did not miss any scheduled competition due to injury. Average (mean) rehabilitation times for a return to sports-specific training in conservatively managed PCL injuries is 10.6 weeks, with a return to full play not usually attained until 16.4 weeks post injury. 5 Therefore, the case example (n=1!) is encouraging. The BFR appeared to help maintain muscle bulk (and therefore strength) and was subjectively reported to immediately decrease the athlete’s pain. Does BFR increase strength and improve function in the wider population? There are promising results that BFR can help maintain and improve older adults’ strength and mobility.6-8 Prior to seeing it in action, I was a little skeptical about its benefits to tissues proximal to the occlusion. 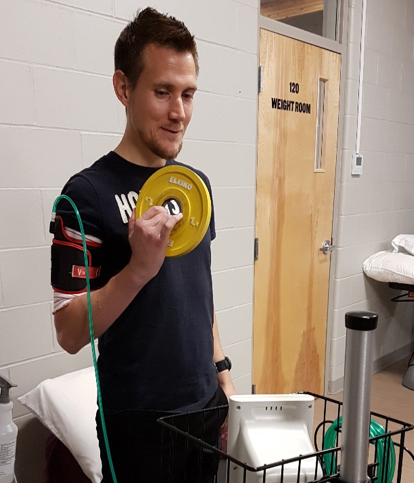 However, I learnt from discussions with the medical team at Rugby Canada as well as from a review that BFR may maintain or increase proximal muscle strength.9 Areas such as the pectorals and gluteals – that work synergistically with the muscles of the limb that are put under increased physiological load – appear to respond favourably to BFR. BFR can be done safely and effectively across a variety of settings with minimal additional training. 10 We now even have clear guidelines for using BFRT…so why not give it a try? If it is good enough for professional athletes to help speed up recovery, why are we not offering it to the wider population (e.g. strength programs in older adults with joint pathology)? Paul (left) using blood flow restriction with the cuff in place and the monitor (right) set at 50% occlusion for the biceps. After seeing the procedure in action and the increased physical effort of performing a normal sub-maximal contraction using BFRT, I was coerced into trying the protocol. Sadly, it did not improve this old marathoner’s bicep girth in a single treatment. 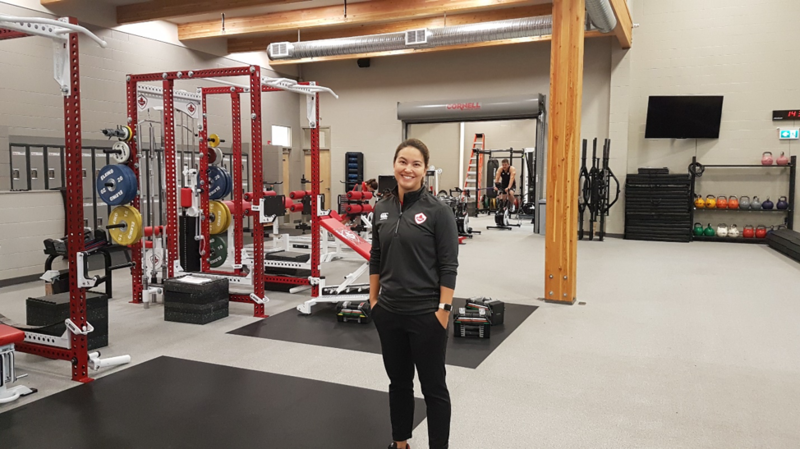 Image: Danielle Mah, Rugby Canada’s Head Physiotherapist and Medical Manager, showing off Rugby Canada’s strength and conditioning / rehabilitation gym. Agolley D, Gabr A, Benjamin-Laing H, et al. Successful return to sports in athletes following non-operative management of acute isolated posterior cruciate ligament injuries.Bone Joint J. 2017;99-B:774–8.